On a cold and rainy day I love staying indoors and listening to music whilst watching the rain. I just feel so calm. 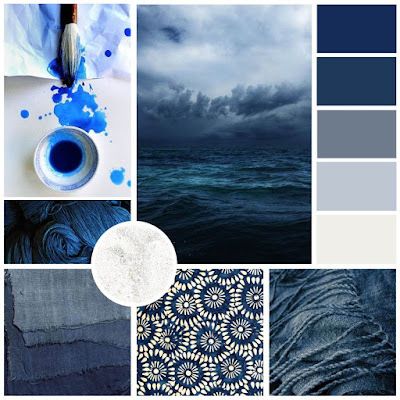 I think the mood board of Kaisercraft's April blog challenge captures this feeling. 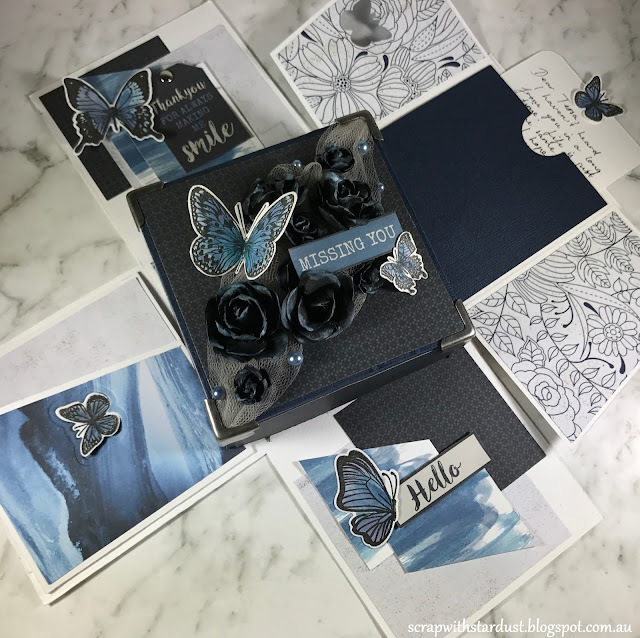 For this challenge we can create any project so I decided to make an 'Miss you' themed explosion box using Kaisercraft's 'Indigo Skies' collection. I am in love with this paper collection, and yes, ok, my favourite colour is blue, so I may be a tad biased... but these papers are just gorgeous! The structure of this explosion box is very similar to the basic 4x4 inch explosion box, except there is only one layer (the layer which has 4 x 4 panels). To decorate the outside of the base, I cut four pieces of 3 3/4 x 3 3/4 inch from some patterned paper and adhered these to each side. For the lid, I cut one 6 13/16 x 6 13/16 inch square for the top and four 1 1/4 x 6 13/16 pieces for the sides. I decided to add some tulle, pearls, flowers and butterflies. 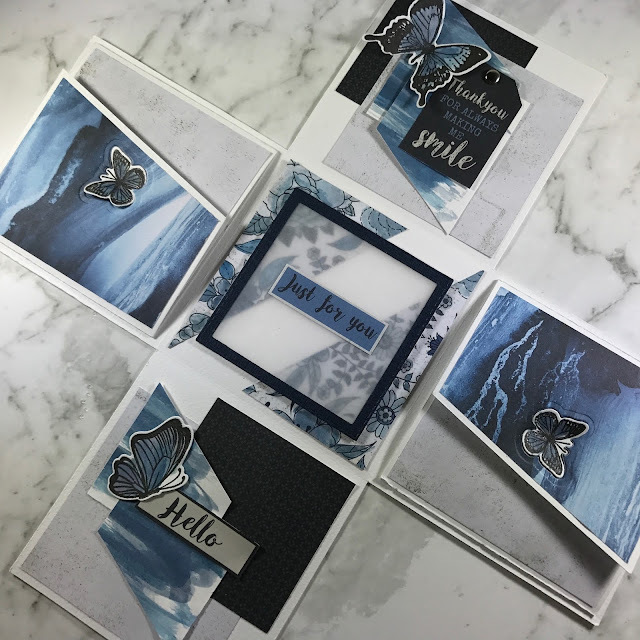 Using the leftover pieces of white cardstock I stamped and cut out a variety of butterflies with black pigment ink. 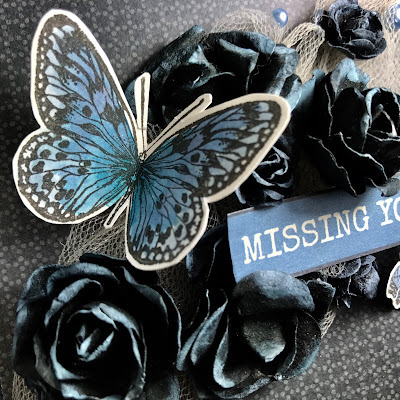 To tie all the decorations together I mixed some of the Kaisercraft mists (denim, wisteria and charcoal) to make an indigo colour to paint the butterflies. I also added some white paint to this mix of mists to paint the tips of the petals on the flowers. By using the mists instead of watercolour paint I was able to have some extra shimmer on the butterflies and flowers. To decorate the inside I decided to create some pockets with some flaps. I used a butterfly stamp and coordinating die to create a 'button' to keep the flaps in place. 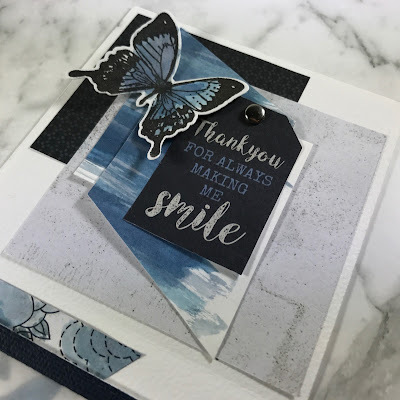 Using one of the leftover 4 x 4 inch cardstock pieces I painted it with the leftover mist mixture. 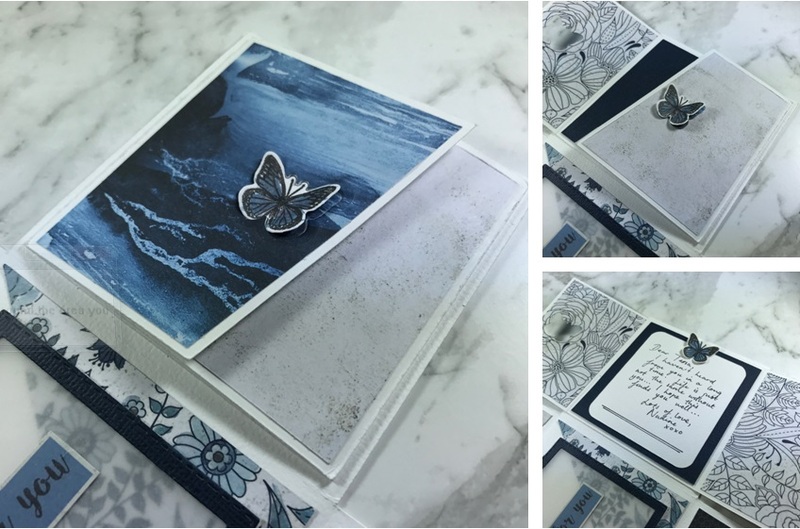 I then cut it up into 4 different pieces and used it to decorate two of the sides and added some sentiments on top. I also decided to add some butterflies to finish. 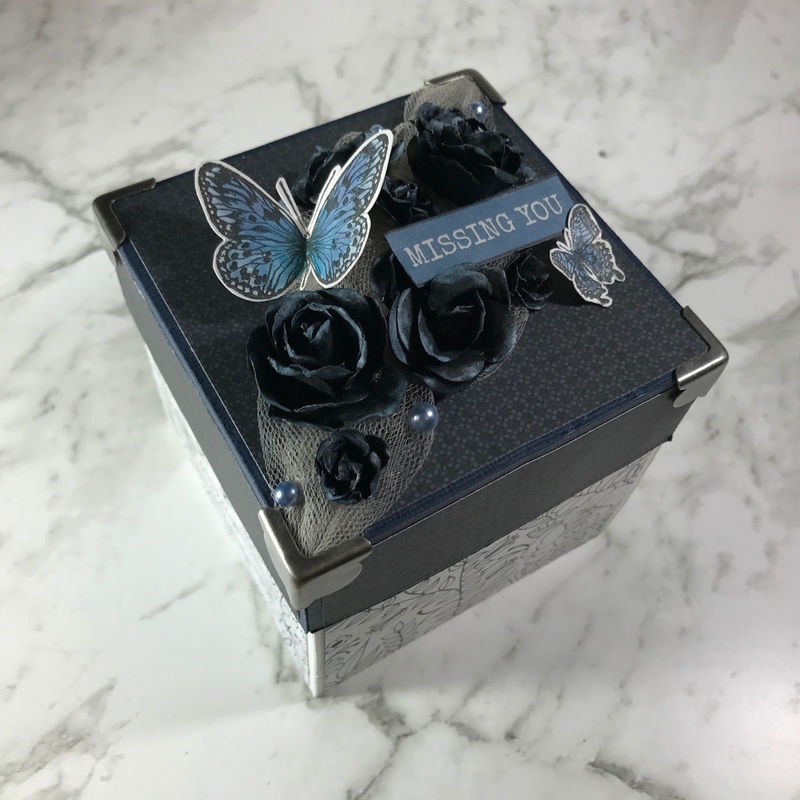 For the middle of the box I used the same paper used to decorate the outside of the base, except this time I painted the flowers with the mists and then added a sentiment. 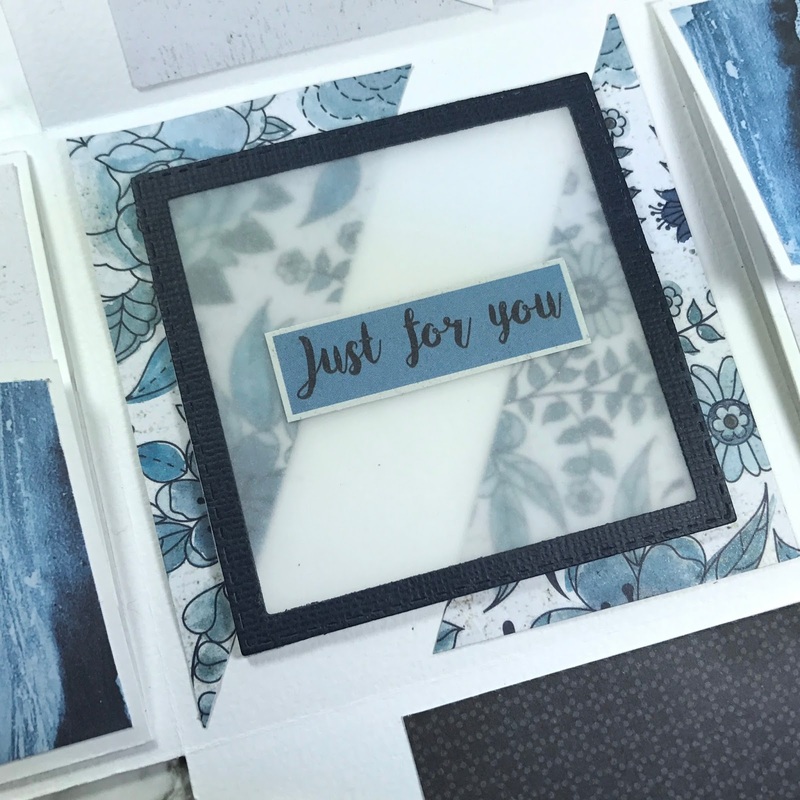 To add a bit more interest I decided to add a piece of vellum and a square border. I think I was able to capture the theme I was going for. I had a lot of fun making this (just love all the blue) and I hope this project inspires you to create!